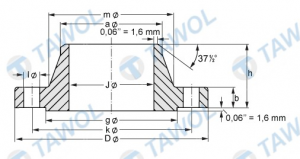 Neck Flanges / PPUH TAWOL SP.J. We offer high quality welded neck flanges, made according to standards or according to the customer's expectations (based on the provided drawings). We are able to produce flanges of atypical sizes from a variety of materials and for different pressures. They are used in piping systems where reliability is required. Our flanges are made of black steel, boiler steel, alloy steel, structural steel, steel for pressure applications (e.g. P355), acid-resistant steel, stainless steel, Duplex and super Duplex steel, heat-resistant steel, high-temperature steel, aluminium, non-ferrous metals (bronze and brass), as well as titanium, so they are guaranteed to work effectively even under the most difficult conditions. We prioritize customer's expectations and always adjust the offer to individual requirements. A large machine and tools park makes it possible to offer virtually any shape of flanges, even square, non-typical, or oval ones. For details regarding our offer of neck flanges, please contact us by telephone or e-mail. Our employees have a wealth of experience, which makes them able to advise you at every step of the order; they also offer assistance in choosing the most optimal solution. The neck flanges we produce, in addition to standard necks, may also have atypical designs. Using the material in stock (impression die forgings of neck flanges, forged shafts, as well as forged rings and discs) we can offer a full range of custom neck flanges. We have experience in the manufacturing of reducing neck flanges (where the size of the flange is larger than the size of the neck); so-called Long Welding Neck flanges – with special long hubs instead of standard ones, Nipolet Flange – flanges with extended hub in the form of a funnel ending with a special "-olet" (weldolet, sockolet, thredolet, latrolet, elbolet). 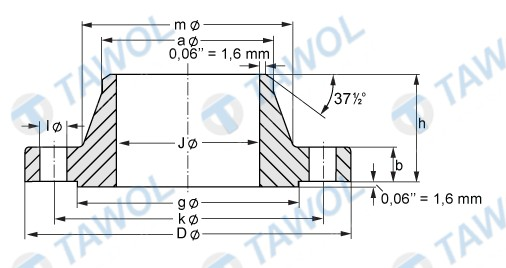 Double flange reducing element – consists of two neck flanges (usually of different sizes) connected by a reducer, made from one piece of steel (usually a forged shaft). It is important that it is fitted precisely, so its dimensions must be determined in detail before executing the order. All our flanges have the necessary approvals and are made in accordance with national and international standards. We also have other types of flanges in our offer. Feel free to familiarize yourself with our offer; if you have any questions, please contact us. We will be happy to provide you with detailed information about our products. We are solid and dependable; we are constantly raising our qualifications and broadening our offer to remain as competitive as possible. By providing our customers with high-quality reliable products we support them in large and complex projects. We are looking forward to working with you.